What, really, is the point of a school performance report? This is the question that hasn’t been answered in the discussion about school accountability. Is it to measure the teaching quality so parents know if their child’s school is really a good school? Or is it a self-assessment measure for schools to look at their own performance to find ways to improve? Maybe it’s supposed to be both, but there’s no clear answer beyond political platitudes. Regardless, the idea of a school performance report sounds great in theory. Like a student’s report card, school performance reports come with a single A-F scale that is familiar and easy to understand, but it’s so simple that it often leaves out other factors. Also, each grade on a student’s report card is usually the result of many different types of assessments while a school performance report is based on the outcome of a single test taken by students at the end of the school year. 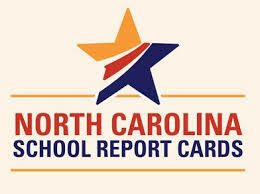 In North Carolina, the school performance report system uses the single-grade method, and it is based on a single test in grades 3-8, and a small number of factors for high schools. And even that formula is criticized for being weighted too heavily in favor of achievement rather than growth. Testing is the easiest, but not most accurate way, of measuring success. Federal law requires all public school students in grades 3-8 be tested annually in math and language arts, science in fifth and eighth grades, and high school students must take one math, one English, and one science test before graduation. Therefore, using that federally mandated data as the yardstick for school accountability makes sense. How students perform on these tests, known as End of Grade in elementary and middle school and End of Course in high school, becomes the basis for the whole school’s grade on its performance report. Each school is then given an A-F grade based on a 15-point scale, which means 85-100 equals an A, and 70-84 equals a B, and so on, but the 15-point scale will become a 10-point scale starting with the 2017-18 school year under current law. The points are based on a combination of two factors from the EOG/EOC scores known as achievement and growth, with achievement counting for 80 percent of the points and growth counting 20 percent. One of the most debated questions about school report cards is how to measure student performance. No one can seem to agree on whether it is better to weigh these different measures equally or bias the scores towards one as it is now. The fact is, there is no easy answer, but the choice does make a difference because each one tells a different story. Achievement is a headcount of how many students scored a passing grade, while growth is measure of how much curriculum content the students mastered in a single school year. Students who don’t earn a passing grade can still show tremendous growth in a year, especially if they were below grade level to start the school year. There are those who argue that moving a struggling student closer to proficiency is a more accurate picture of teaching effectiveness than whether a student earned a high-enough scaled score on the test. “Proficiency rewards schools for the students they take in, not necessarily how they teach students,” said Rep. D. Craig Horn, Co-Chairman of the House K-12 Education Committee while debating HB 322 recently. The bill would move the weighting of achievement and growth to 50-50, which the House passed 116-2 on March 15. It is awaiting action in the Committee on Rules and Operations of the Senate. When it comes to growth, the ideal is that every student grows one full school year each year. That is also the baseline when measuring the effectiveness of a teacher, and North Carolina relies on a proprietary growth algorithm to measure its students which was developed by SAS in Cary. For a few years, the state Department of Public Instruction included this growth measure in teacher performance evaluations. It was removed in 2015 as an official standard in the evaluation tool, but it remains an indicator for teachers and school-based administrators to evaluate their effectiveness each year. This is an important measure because there are enough cases where teachers have classes of students who don’t earn passing grades on state tests, but they show a great deal of growth compared to the previous year. Without growth, teachers in this situation could be considered ineffective. Growth is also a more stable measure year-to-year than achievement, especially for students with mixed achievement results. An example of this situation is a student who enters fourth grade capable of doing second grade math. With the help of an effective classroom teacher and extra support from specialized math intervention teachers, the student shows 1.5 years of growth on the EOG, but still doesn’t earn a passing grade. The student went from being two years to a half-year behind in math. That’s a tremendous gap that was reduced, but it wasn’t reduced enough for the student to achieve at grade level. In cases where achievement is weighted heavily, as with the current formula, schools with high numbers of students who perform as above on state tests have lower school performance grades of C, D, or F. By simply shifting the formula to 50-50, many of those C schools would earn a B, and D schools would move to C, and so on. Proponents of this shift argue it would be more accurate, but it would also help to reduce stigma of good schools that get tagged with the “continually low-performing” rating. School performance reports must be easy for everyone to understand. That’s the argument made by many in favor of keeping a single A-F grade for a school. A single grade is simple and the A-F scale is familiar to everyone. At a glance, people with no special knowledge of education can easily understand if a school is effective at teaching its students. Critics of this also agree that simplicity is a top priority, but they insist that being too simple may create a negative picture of a school’s effectiveness which will stigmatize a school and incorrectly label it as low-performing. They suggest that multiple grades be used, and at the very least performance reports should have two grades: one for achievement and one for growth on the A-F scale. This discussion is a completely separate argument from the weighting one above. Those who favor a single grade say more than one grade may confuse parents and community members. Proponents say that student report cards have multiple grades showing performance in different subjects, so having two grades on a school report card wouldn’t be as confusing as some say. The idea of having two grades has its merits, because the separate grades can reveal the fact that a low-achieving school is very good at helping its students to close learning gaps through high growth. This distinction may save the school, its teachers, and its students from being labeled as low-performing. This method would place both measures on equal footing without forcing them to compete with each other, and providing a separate letter grade for each measure wouldn’t lead to an unfair high or low report card grade for the whole school. What Other Qualities Could Be Measured? Measuring student outcomes is just one way to evaluate a school’s performance, but there are so many other factors that contribute to a school’s success rate. Some of those factors include student attendance, teacher working conditions, student discipline such as suspensions, and rate of English fluency for non-native English speaking students. That last one, English learning, is now a component of the federally mandated reported schools will have to make under the new Every Student Achieves Act (ESSA), a law enacted in late-2015 that replaced the No Child Left Behind Act. North Carolina is developing a new school performance accountability plan to line up with the regulations created under the ESSA law, and DPI plans to submit its draft to the federal Department of Education in September for approval. What ESSA requires and what North Carolina uses to rate school effectiveness are different, and this creates another issue about simplicity versus confusion. The NC school grading system was created by a law passed by the General Assembly and signed by the governor. The federal ESSA regulations give the state Board of Education the authority to draft and approve a school accountability plan based on test scores and other factors that is approved only by the federal Department of Education. WakeEd has previously advocated for creating a single accountability tool that meets the federal standards and fairly reports the performance of public schools across the state. 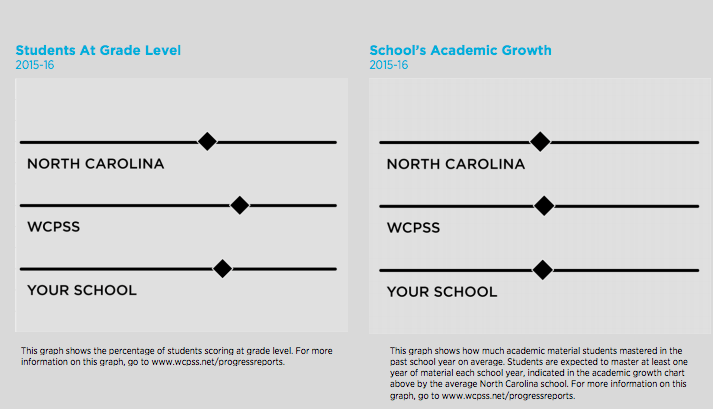 There is one example that balances the issue of being simple but comprehensive, and that is the school progress reports produced by the Wake County Public School System for each of its 177 schools. These reports show how the school compares to the same type of school – elementary, middle or high, within WCPSS and statewide. The progress indicators don’t use letter grades, averages, or any numbers at all. They simply show how the school performed separately in achievement (grade-level) and growth. Readers can easily see if the school is performing better or worse than the district and state averages. On the back is an easy-to-read table with four major areas school performance on state tests, teacher qualifications and quality, school climate, and how the school’s leadership is rated. These are actual percentages for the school which are compared to the district and statewide averages. This two-page document effectively gives the simple snapshot of a school’s performance in the previous academic year, and provides quantitative details about factors which contribute to a school’s overall performance. Most importantly, there’s no A-F letter grade. There’s no stigma for the low-performing schools. Their performance isn’t hidden or watered down. The message is still clear that the school needs improvement in either achievement, growth, both, or multiple other areas not directly related to testing. This is the type of school report card that North Carolina should adopt. It is simple, visual, and comprehensive. The public can easily understand if the school is meeting expectations or not. Parents can decide if the school is the best fit for their children. Behind the scenes, DPI can still work with the low-performing schools based on actual numbers without the schools facing an embarrassing label. Even if the school performance reports that WCPSS uses don’t quite meet the requirements of ESSA, they can be easily modified. In fact, the report cards could easily be improved with another easy to understand graph that shows multi-year trends in achievement and growth. Producing the reports would be easily done as well, because the data contained in the WCPSS ones is from information that is already being collected. Most importantly, a report like this puts to rest several arguments that are complicating the discussion about measuring school performance. Achievement and growth are measured separately, but compared to district and statewide results for context. There’s no need to average their scores together in any weighted format. There’s no need to decide if one measure is more important than the other. Finally, people reading the report will have a clear sense of what the areas of improvement are for a school. Low achievement, and high growth is a lot more precise than a D grade. Mediocre test scores and a poor school climate might be an indication that a leadership change could make a difference. The goal of a school performance report should be the same as a student’s report card: It should display progress in a defined range of expectations in an easy-to-read and understand format. However, unlike a student’s report card, which is private and kept between school and home, a school performance report is public. A low grade on a student’s report card wouldn’t be used to publicly shame the student into improving, and the same goes for a school. Public accountability for school performance is necessary, and reporting it so anyone can understand it is the minimum standard. Developing a performance reporting system that creates a culture of improvement means schools will be empowered to show gains in both achievement and growth. Those that need help will continue to get it. Most importantly, parents will know precisely how their children’s schools are performing. That’s the point of a school performance report.